A smaller unit won't necessarily save energy. The stains on the concrete pad show that the new air conditioner has a smaller footprint than the oversized unit it replaced. 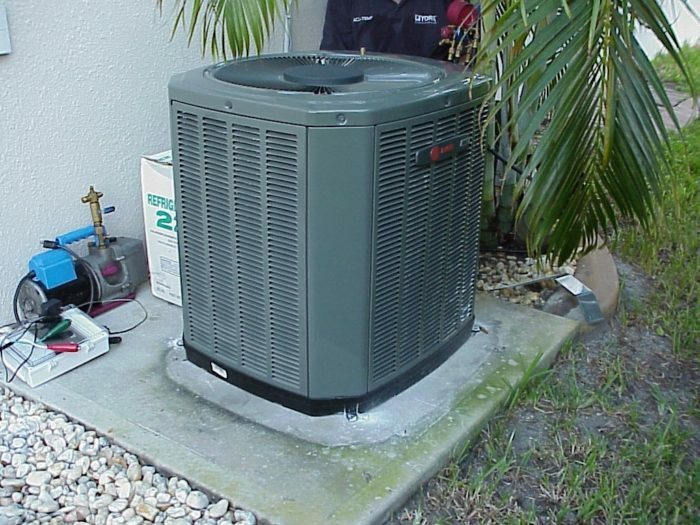 Although most energy-efficiency experts strongly urge contractors to avoid oversizing HVAC equipment, researchers from the Florida Solar Energy Center have shown that right-sized air conditioners often use just as much energy as oversized equipment. If you’ve been paying attention to energy-efficiency experts and green-building Web sites, you probably know that it’s important to properly size your HVAC equipment. Most sources repeat the same advice: oversized furnaces and air conditioners cost too much, waste energy, and sometimes provide lower levels of comfort. To avoid these problems, the first step is to insist that your HVAC contractor perform a Manual J calculation to determine the heat loss and heat gain for each room of your house under peak (worst-case) conditions. Then your contractor can specify equipment that meets Manual J requirements. Sounds easy, right? Well, it isn’t. In most areas of the country, it’s very difficult to find a residential HVAC contractor who is willing to perform Manual J and Manual D calculations. According to the U.S. Department of Energy’s Office of Energy Efficiency and Renewable Energy, “Homeowners should insist that contractors use a correct sizing calculation before signing a contract. This service is often offered at little or no cost to homeowners by … conscientious heating and air conditioning contractors.” Yeah, right. The government Web site goes on to advise, “When the contractors are finished, get a copy of their calculations, assumptions, and the computer printout or finished worksheet.” Well, that’s easy for you to say. But just see how easy it is to get that paperwork from Bob once his Do-It-Right HVAC Service has finished installing your new air conditioner. Manual J and Manual D are calculation worksheets published by the Air Conditioning Contractors of America (ACCA). For many years, these worksheets have been the standard methods for calculating residential heat loss, heat gain, and duct sizes. The best-known Manual J software programs are Elite RHVAC, Wrightsoft Right-J8, Adtek AccuLoads, and EnergyGauge. Software programs for Manual D duct design include Elite DuctSize and Wrightsoft Right-D.
A Manual J heat loss and heat gain calculation considers most of the factors that affect HVAC equipment sizing, including the climate; the size, shape and orientation of the house; the home’s air leakage rate; the amount of insulation installed; the window areas, window orientations, and glazing specifications; the type of lighting and major home appliances; and the number and even the age of the occupants. For the calculations to be meaningful, information on all of these factors must be correctly entered into the software program. Where can I find a contractor to do it? As with many code provisions, the requirement for Manual J and Manual D calculations is widely ignored and rarely enforced. Most residential furnaces, boilers, and air conditioners are still sized by rules of thumb instead of careful calculations. As a result, almost all of the HVAC equipment installed in U.S. homes is oversized. Dozens of studies have confirmed that the degree of oversizing typically ranges from 30% to 200%. In his posted comment, Bailes raised an interesting point: the problem of “garbage in, garbage out” (GIGO) Manual J calculations. Several energy experts have commented on the GIGO problem, including John Proctor, Hank Rutkowski, and Allison Bailes. According to Lstiburek, his experience proved that high-performance Building America homes in Las Vegas could have had HVAC systems sized at about 60% of Manual J. To be conservative, his team recommended installing systems sized at 80% of Manual J. There are strong arguments against routine oversizing of HVAC equipment. The best argument is simple: oversized equipment usually costs more than right-sized equipment. Oversized equipment suffers from short cycling. For example, an oversized furnace brings a home up to temperature quickly, and then shuts off. A few minutes later, it comes on again, only to shut off quickly. Many homeowners find the see-saw sound of a short-cycling furnace to be annoying. Increasing evidence shows that energy experts have exaggerated the negative effects of equipment oversizing, however. Studies have confirmed that oversized furnaces don’t use any more energy than right-sized furnaces. Moreover, newer modulating or two-speed furnaces operate efficiently under part-load conditions, solving any possible problems from furnace oversizing. Although there are ample reasons to believe that oversized air conditioners are less effective than right-sized equipment at dehumidification, at least one field study was unable to measure any performance improvements or energy savings after replacing an existing oversized air conditioner with a new right-sized unit. The main reason to choose right-sized equipment is to avoid paying too much money for equipment you don’t need. 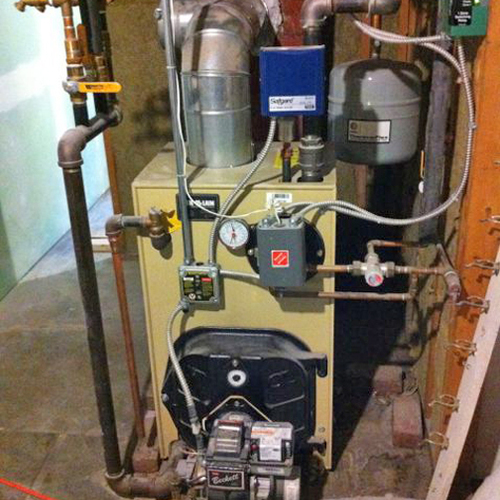 A Manual J calculation will ensure you don’t spend more than necessary for your furnace, boiler, or air conditioner. Moreover, a Manual J calculation will provide room-by-room heat loss and heat-gain information that is essential to good duct design. Without good duct design, you’re running the risk of comfort complaints. I don't see how you can draw any conclusions from testing air conditioners in typical poorly built Florida Homes that have air handlers in garages and attics,Low R-value walls AND ceilings that resemble Swiss Cheese. I think as we improve our enclosures that Right Sizing will have much more benefit than just saving money on equipment. Great article, as always, Martin. Of course, there's always more you could've written, but you have to keep your articles from turning into books, so let me raise a few more points that didn't make the cut above. First, Manuals J & D don't stand alone. Once you get the loads (Manual J), you have to select equipment (Manual S) and work out some of the air distribution issues (Manual T) before designing the duct system (Manual D). To do all this correctly, you have to understand air flow - static pressure, friction rates, net free area... As you pointed out, most HVAC contractors don't even understand J, much less S, T, or D.
Second, one problem you didn't mention in regards to short cycling is the decreased equipment life. It's starting up and shutting down that causes most of the wear and tear, so short cycling equipment probably doesn't last as long. I haven't seen a study of that, though, so let me know if you're aware of one. Third, I learned from you over in the Q&A section here at GBA a while back about another FSEC study showing that right-sized cooling systems can sometimes make the relative humidity higher in a house. Of course, that comes from looking at only one part of the system - the equipment size - without considering the effect of the ducts. Now, let me give you an example of right-sizing gone wrong. This was a spray foam insulated house with equipment put in according to Manual J loads, but the contractor didn't do anything different about the duct design than he usually does. The cooling systems couldn't keep up in summer, however, with temperatures barely getting below 80 F with the units running continuously. I measured the air flow with a flow hood, and the 7 tons of equipment capacity was moving 5 tons worth of air - 2000 cfm instead of 2800 cfm. As with everything else in this field, you have to take a systems view and not focus on one detail. You wrote, "I don't see how you can draw any conclusions" from the cited FSEC study. In response, let me say that I draw exactly the conclusion that the Florida data support: replacing an existing oversized air conditioner with a new right-sized unit probably won't save energy or improve occupant comfort, unless duct location, duct leakage, and duct insulation problems are simultaneously addressed. We all owe a debt of gratitude to researchers. Their data are essential to the advancement of building science. Don't throw the baby out with the bathwater. Read the study and find out what it means. Sorry about my new construction "tunnel vision"
I will read the study more carefully. I did not realize that this article and "The bottom line" was strictly about replacing Existing equipment. I so agree with Dr. Bailes on ALL 4 MANUALS. It’s amazing to me how most HVAC contractor don’t even know what you are talking about when you ask for all 4 manuals. Adding more to the problem is that most manual Js are run with the wrong design temperature, wrong multiplier, and etc. etc. The scenario you layout is exactly what I am seeing with my HVAC contractor. He runs manual S and J but that is as far as he will go. The attitude I get is that duct work will deliver the right amount of air no matter how it is run. 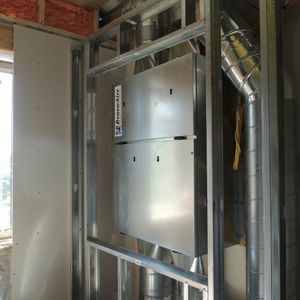 I have recently been trying to put all of my duct work in conditioned areas. We build on crawl spaces so on a 2 story home the 1st floor ducts come up from a sealed crawl and on the 2nd floor ducts go between holes in floor trusses. We are seeing issues on the 2nd floor with comfort. It feels humid even with the A/C running for long periods of time. We are using a 1.5 ton 14 SEER heat pump for about 1340 SF. The Manual J says the cooling load is about .8 tons. A 1.5 ton unit is the smallest available according to my contractor. I would suspect that I am losing air flow because of the way duct work is run through the trusses. Bends and branches in flex duct work without a plan. If the unit was truly oversized I wouldn't think humidity would be an issue. I also need to consider that the Manual J has incorrect inputs in it. The home tested at 3 ACH and I received a HERS rating of 60. 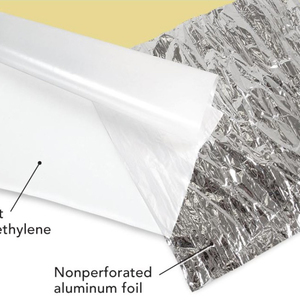 I am using batt insulation, house wrap, and caulking or filling around holes and cracks that penetrate the thermal envelope. Do you need some certfication to run these manual calculations? I am at a point where I would like to do my own for the piece mind that my contractors are the same. In the end it will be my problem if the unit doesn't operate correctly. 1. Manual J and Manual D calculations are required by code. 2. These calculations are necessary because they provide you with design airflows in CFM for each room. 3. Every HVAC system needs to be commissioned. Commissioning includes measuring the airflow at the coil, and the airflow at each register in every room, to verify that the delivered cfm matches the design cfm. 4. If your HVAC contractor skipped some of these steps, there's no way of knowing what's wrong with your system. 5. If your HVAC contractor can't step up to the plate, you'll have to hire a home performance contractor, an energy consultant, or an engineer to perform the necessary design work, verification testing, and equipment commissioning. There is very little data to suggest significant energy savings from 'right-sizing" equipment. Smaller equipment has some cost advantage but perhaps it's biggest benefit is that the previously undersized duct system is not as undersized when you install smaller equipment. Of all the ACCA manual's, I'd be most concerned with following D for comfort and probably energy efficiency. . I'd be interested in any data people can find showing an impact on equipment lifespan, because I've heard that claim before but never seen any data to support it. I have to chime in to note the system approach to these problems. A system that consists of a good air barrier, thermal barrier, and all HVAC inside the building envelope is the only way to acheive proper conditions for the manuel calculations to be totaly true. With proper ventilation this would be the perfect building. 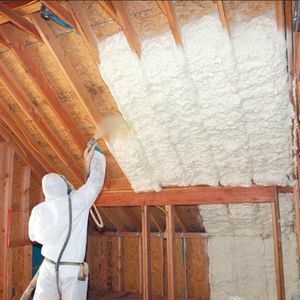 First, the contractors do not have a clue about air barriers, they do not believe the attic should be sealed and fiberglass batt insulation is the greatest thing since sliced bread. There is not a HVAC contractor in the country that can overcome all of these faults of the builder. In their defense, in the coastal southeast humidity you cannot expect a 55 degree coil in a 140 degree attic to not condensate profusely. The HVAC contractor knows that in these building conditions, if he follows manuel J he will get calls in the summer for too hot and calls in the winter for being too cold. The easy thing for him to do is oversize so he does not get these phone calls. That is how it happens every day. If a "system" is followed everybody contributes to the success of the "system" instead of trying to blame one subcontractor (HVAC) for everybody elses shortcomings. United we build a workable system, divided we build pretty much as is common today. Putting all HVAC equipment and ductwork in conditioned space not only extends the service life of the equipment, but the maintenance and energy savings are nothing to sneeze at. Speaking of sneezing, an HVAC system inside the building envelope with a good air and thermal barrier and properly ventilated will leave you nothing to sneeze at. I can understand that one would expect an HVAC contractor do a manual J calculation when retrofitting a furnace/air conditioner. But I don't think they should be the one determining heat load for new construction. Shouldn't it be a requirement that new homes/buildings be designed with the heat load in mind right from the start? Kind of like Passive House! An artifact of the architect/designer/builder's design is the heat load. God forbid we still think it is acceptable that a designer be able to go through the design process for a building without knowing what the heat load is when they come out the other end of an iterative design process? Designers/architects probably still aren't using pen and paper to design buildings. If the designer can design the building using software they ought also to be able to resolve the buildings heat load as well. It seems everyone is letting off the designer of the building a little to easily. Andrew, I'm glad to hear someone say that. I'm an architect and have recently been certified a HERS rater and now working on learning the HVAC 'manuals' software. I agree with the house-as-a-system design approach and intend on going forward with that methodology....and not leaving anything up to subcontractors that I might have no control over the selection of. As always, great discussion guys. While the 2 stage funaces cover a wide range of heating loads, AC sizing is more important. A properly sized cooling unit will run longer between cycles and take out more indoor humidity than an oversized one. The cooling setpoint can be higher as the lower indoor humidity level will feel comfortable. Heating systems design, both the determination of the heat load and the design of the distribution system, are best done as the thermal envelope and the room layout of the house are being designed. As Hunter said some architects/designers are already taking on this responsibility and I have seen schematic approach integrated into some architecture courses at universities. When we design custom homes at our office we use CAD software that creates a virtual 3D model. It is very convenient to pull the necessary quantities required for the calculations. Also different systems can be overlayed (structural, electrical, mechanical, etc) to visualize for conflicts and efficiencies. My understanding is that Manual J, Manual D and the HERS system are based on ASHRAE heat load calculations. ASHRAE heat load calcs are simplified to not account for solar or internal heat gains (although I think ASHRAE cooling calcs do). Passivhaus PHPP is German import and I am unable to understand it 100% because it references German standards that are not translated into English. I don't know if PHIUS (the US Passivhaus institute) has the capacity to provide the support necessary to have the PHPP be consistently used in the American market. The PHPP works very well when you can use European components (windows, ventilation equipment) that have been certified by the Passivhaus Institute. Its a little bit of approximation when domestic equipment is used. We need a fully developed and supported American PHPP. What institute will head this? The grassroots PHIUS that is an embassy for PHI? I think this should fall on ASHRAE's lap but this becomes a turf war between the architects and HVAC contractors. In almost all jobs I design we get a Mechanical Engineer involved to do all manuals and design the HVAC the right way. As a rule I never let the HVAC contractor do that work. An ME is an independent, third party designer who is not biased to oversize the system and with his designs my clients get much better bids. I can count in one hand the HVAC contractors capable/willing to do the correct calculations and design in 12+ years of designing high performing homes. Armado, Do you employ ME's on residential projects or just commercial? I've found it difficult to bring another engineer's fees into the mix on residential. I think that would be the way to go if my clients would agree. I agree with J chestnut that we need much better energy/envelope modeling software. Remrate is fine, but it doesn't take into account enough about the actual geometry of the house. I would like to see more rigorous solar studies on the model to determine heat gains. I do use a ME on all residential projects. You may have to shop around; when we first started, prices where pretty high ($1.00/sf +), but they came down in the last 10 years or so. Now that the market is bad, prices have come down even more. Now it’s around $0.50 per sf in NM. In TX I did found an HVAC contractor to use his ME but it took four calculations and redesigns and a “come to Jesus” meeting for them to agree to do it correctly. I do review all work before the Builder/Customer makes the final decision. Supply and Demand will work on lower prices. It is my experience that I get much smaller equipment, better duct design (4 manuals), higher quality installation inspected by the ME and a final commissioning and balancing of the system. In climates where humidification and dehumidification is highly needed, you should run Manual P. If you use Heat pumps, Manual H. If you use Hydronic, Manual GAMA H22. If you are zoning, Manual RS. Here in central NC we've been beating the drum on right-sized mechanicals for decades now and I've never once heard the claim that the intent of the right-sizing approach was energy savings. The Florida study could not be more irrelevant to the true issue here which is maintaining indoor air quality through proper dehumidification and reducing opportunities for condensation and mold growth within the conditioned envelope. This study was conducted on homes with terminally compromised thermal/hygric enclosures. As a cautionary tale of why you shouldn't expect miraculous results from poorly conceived piecemeal upgrades it has some value but I'd hate to see it quoted as a reason NOT to apply best-practice engineering to mechanical systems in properly built homes. In heat pump territory (such as here in Virginia), "right-sizing" heat pumps might be leading to an overall increase in energy use. 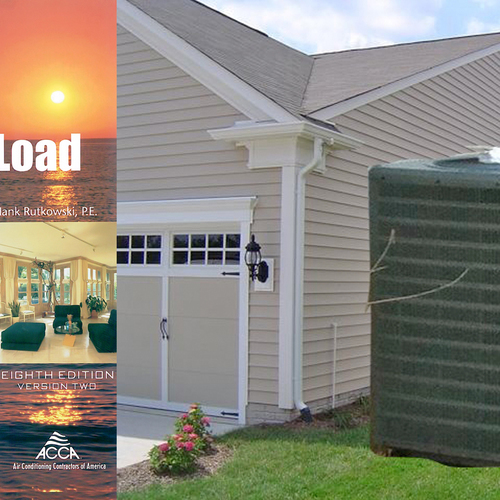 Heat pump systems are sized to the cooling load. If the design heat load is greater than the capacity of the heat pump at design temperatures, then an electric resistance heater kit is added to the system to make up the difference. I'm seeing a lot of cases where "right-sized" heat pumps are quite a bit undersized for the heating load, thereby leading to an increase in the use of the inefficient electric resistance heater. Behold the recent case of an Energy Star house I rated where the heat pump was "right-sized" to match the cooling load, but at design heating conditions, was only able to satisfy about 25% of the load. The other 75% of the load was handled by electric resistance heating. This is not a good way to save energy. The picture of the smaller compressor unit where the original one stood says little. The most efficient AC units these days have a large cooling fin surface and the appliance is really big compared to older, less efficient models. I believe there are many reasons contractors don’t provide quality Manual J’s. I have herd so estimate that 80% of the residential HVAC change out market is not permitted. If true it’s not hard to figure out why many don’t do them. Poorly done Manual J’s usually stem from a lack of training and/or review. 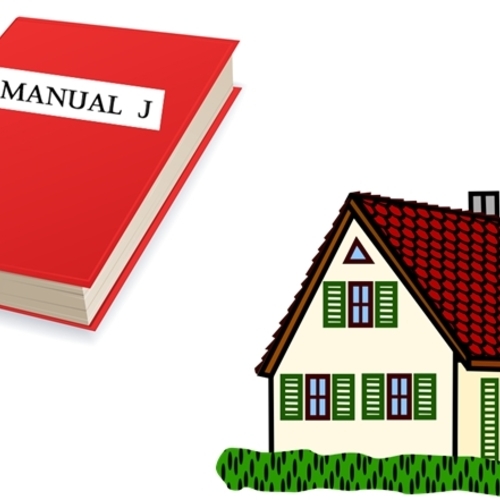 Educated homeowners and contractors should insist they get a copy of the manual j before they give any deposits. I recommend you review some of the basics it’s not very hard or time consuming. I have included links to ACCA’s site that should help anyone trying to review the manuals for accuracy. Some basic issues I see every day that are incorrectly reported on Manual J’s; design temperatures, area and volume, duct system location, insulation values, window areas, orientation, ventilation systems, infiltration rates. Most of these are easy to spot with a quick review. The only way we can expect the industry to get better is by raising the bar. If you don’t insist on getting a proper Manual J you probably won’t. The contractor that wants to charge thousands more to do a Manual D makes me chuckle. If the contractor has invested in software to do the calculations its nothing more then a few mouse clicks. It just proves he is ignorant about the technology. 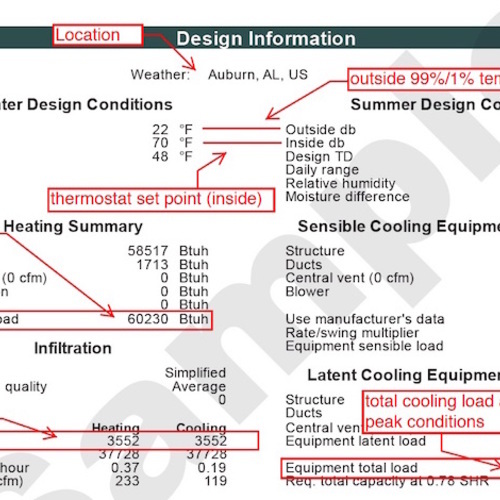 I agree that architects should be more involved in calculating heat and cooling loads as part of a systematic design process. The Passive House Planning Package (PHPP) allows architects to do this with some training. I don't think it's necessary to have a separate American version. There is some tweaking that could make it easier for us in the US. For example, allowing direct input of NFRC data for windows. PHPP calculates energy demand for buildings. It is compatible with international norms (ISO 13790) and well validated with dynamic simulation tools as well as with measured data. It is especially adapted to high-performance buildings and can be used to prove Passive House requirements. The planning package comprises many tools specifically useful for the design of high-performance buildings. Europe and North America. User-defined data can also be used. highlights crucial topics to be considered in Passive House design. I always feel like the growing body of research that shows oversizing to be unimportant is oversimplified. In your next blog you comment on the energy saving available by using a smaller blower, do we leave that out when discussing condensing unit sizing? Also are we discussing correctly installed systems vs correctly installed systems? If so then the oversized system will require significantly larger ducts, which are much more difficult to run well through a truss system or a chase. It seems to me that right sizing is significantly easier and more effective. My company is a small home performance company in california and we are undersizing manual J on all our jobs. Our average system works out to be about 1000 square feet per ton, we are able to guarnetee even comfort and low opperating cost. All of this is possible in part because the smaller equipment allows us to build duct systems that we can fit into the houses. What would you rather install a 12" duct or a 20" duct? That's how we can get the HVAC Monster out of the attic. I do not agree with the prevailing Florida strategy or that "R-10 walls are probably plenty" in the South. 1. I believe strongly in the importance of proper Manual J and D calculations, and I believe strongly in the importance of right-sizing rather than oversizing. There are multiple benefits that accrue from doing it right. 2. I caution builders not to overpromise. We should be wary of promising energy savings due to right sizing. Nevertheless, right sizing is clearly the way to go. > Studies have confirmed that oversized furnaces don't use any more energy than right-sized furnaces. That depends. Unless the furnace and duct system are located inside the envelope, the heat absorbed by the mass of the system will be lost to unconditioned space every time the system cycles off. Due to higher temperature differential, this is a bigger issue for furnaces than for air conditioners and heat pumps. As you point out in the blog, oversized equipment can also lead to comfort issues. This is especially true for furnaces In high performance homes, where gross oversizing is not uncommon. If a furnace only runs 20 minutes out of the hour on a design day, perimeter zones will experience significant temperature droop before the thermostat "sees" the load (the longer the off cycle, the more pronounced the droop). Under part-load conditions, a furnace's minimum run-time logic causes the opposite problem - overshoot. In warmer climates, heat pumps are ideal for high performance homes because they operate continuously at high loads and are unlikely to cause overshoot at part loads. The key is to design the shell so that supplemental heat is minimized. In homes with poor insulation, non-existent air barrier and leaky ducts in the attic, a heat pump may not be the best choice. > Moreover, newer modulating or two-speed furnaces operate efficiently under part-load conditions, solving any possible problems from furnace oversizing. But at a significant price premium. A properly sized single-stage furnace will not overshoot at part load. BTW, if the smallest available furnace that can carry the cooling load is more than 150% of the design load, then a gas-fired hydronic coil may be the best option, assuming natural gas is available. > The main reason to choose right-sized equipment is to avoid paying too much money for equipment you don't need. You make all the right arguments and then drop this bomb? Notwithstanding your Aug 22 comment, this conclusion steals the thunder from your article. 1. I stand by my statement that "Studies have confirmed that oversized furnaces don't use any more energy than right-sized furnaces." If you can cite a study that shows significant energy savings attributable to replacing an existing oversized furnace with a new right-sized furnace, I'd love to read it. 2. Your hypothetical savings are predicated on cases where the furnace and duct system are located outside the thermal envelope. Of course, substantial savings accrue from moving a furnace and ductwork from an unconditioned attic or garage to within a home's conditioned space. The GBA Web site has consistently emphasized the importance of this fact. (To those of us who live in the Northeast or the upper Midwest, it's always astonishing to imagine that anyone would by nutty enough to put a furnace in an unconditioned attic.) But don't attribute these obvious available energy savings to right-sizing; these savings are due to obeying the important principle of locating the HVAC equipment and ductwork where they belong. 3. I agree that a single-stage furnace is often the best option, and that the upgrade to a two-stage furnace doesn't always pencil out (in terms of energy savings). 4. You quote my article -- "The main reason to choose right-sized equipment is to avoid paying too much money for equipment you don't need" -- and then append a comment: "You make all the right arguments and then drop this bomb?" It's not a bomb; it's true. I'm a strong believer in energy conservation, but I also believe that it's important for energy consultants to base their advice on data. Cite studies if you have them. I met with an HVAC contractor and my builder the other day. When I brought up my requirement to have Manual J and a Manual D calculations done prior to me making a final decision on any equipment, the HVAC rep literally told me I could "wipe my [email protected] with a Manual J" and that it didn't provide any useful real world info. Instead, the two HVAC reps asked me for the square footage of my home and threw out "that will probably need 3-1/2 ton equipment". They didn't even know anything about my wall/roof construction, R-values, windows, or overall approach to energy conservation. The meeting was very disappointing. OK, so I've designed a house to be pretty well insulated (PGH), we will shoot for passive house level airtightness... I had a PHPP that needs to be updated and recently ran a new BEOpt that informs me that max heating load can be met with a 9Kbtu Minisplit or equivalent. I had assumed we were going to do a classic 1 or 2 head Minisplit system or heat the whole place with the Minotair + electic resistnace + wood stove through cold spells. HVAC contractor ran Manual J – RHVAC (who knows what data he put in for insulation and airtightness) and came back with 2 ton Carrier Greenspeed Modulating inverter heat pump system. I quote: "the load was ~25,350"
PS - Process note: would this be better as its own Q&A post? It seemed relavent here, but is maybe a separate issue than the original topic. I don't think the HVAC contractor meant 25,350 kBtu. I think the contractor probably meant 25,350 BTU/h.